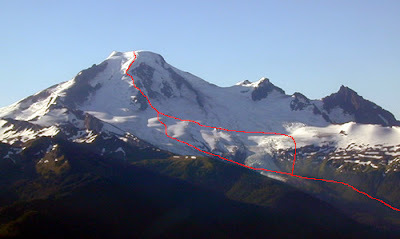 Route Description: A 5+ mile approach to the edge of the Coleman glacier leads across the Coleman and Roosevelt Glaciers to the base of a 50 degree slope leading to the lower North Ridge. Climb the slop for 800 feet and until on the crest. Follow the crest to the base of a prominent ice cliff. From here climb 2-4 pitches of technical ice ranging from 60-85 degrees depending on line choice and conditions. Above the technical ice wind along the broad crest weaving through glacier features as needed until you reach the summit plateau. Notes: This routes is among the classic ice routes in the North Cascades. 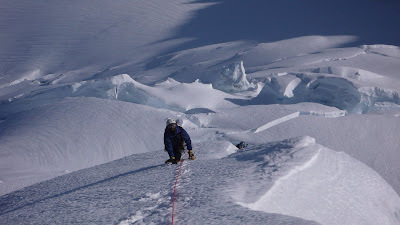 It long season, exposed position, and quality ice pitches put in a very select class of alpine routes. AAI Program Coordinator and Guide Coley Gentzel tells his North Ridge story:I have been alpine climbing for a little over 10 years. Over that span, I been fortunate with weather and conditions more often than not and can recall having failed on alpine climbs only a handful of times. In nearly every case, there has been something unique about these failures. More often than not, when I have failed once on a route, it has taken me at least a couple more efforts to finally succeed on it. In many cases these routes have become my nemeses. On the lower access slope of the North Ridge. The next spring, Andy Bourne (AAI International Programs Coordinator and Guide) and I decided to finish this thing off for once and all. We climbed the route in 12 hours car-to-car, and the climb couldn’t have gone more smoothly. Well that is not entirely true. I forgot my sunglasses and had to poke holes in the back of my balaclava that I used for a face mask. During a brief stop on the decent, Andy fell asleep with half of a Cliff bar still in his mouth and nearly had to be revived. Quite a pair. 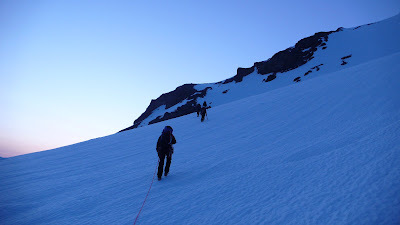 An AAI team gains the crest of the lower ridge. AAI Guide Viren Perumal above the technical ice pitches. Contact Coley if you are interested in setting up a climb of Mt. Baker's North Ridge at cgentzel@aai.cc or 800-424-2249. 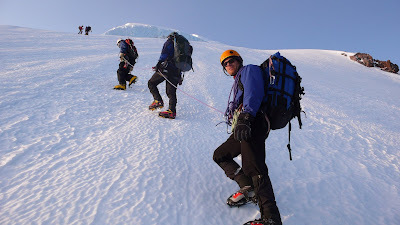 You may also be interested in our 6-Day Alpine Ice Course, during which we make an attempt on the North Ridge or another technical ice route on Mt. Baker.